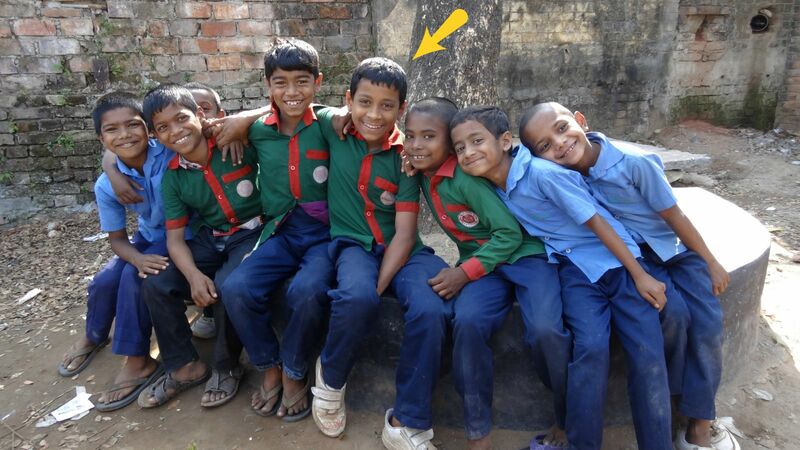 Sajib is an ordinary, nice, and cheerful boy from Bangladesh, who had not attended school up to the age of 10. He lives in Chalantika – in one of the poor boroughs in the capital Dhaka, in a shelter made of bamboo and metal plate. His father left the family some time ago, and Sajib was left alone with his mom and two younger siblings. The family was not able to earn their living anymore, and the mother decided to return to her relatives in the home village. However, Sajib stayed in the slum in Dhaka, to give his grandmother a hand. She works as a maid for more wealthy families, but she does not earn enough for both of them to ensure regular meals, rent and other necessary expenses. Therefore Sajib helps to cover expenses – he collects recyclable litter, paper, plastics and other materials that can be re-used and he sells them. The Chalantika slum, in which he lives with his grandmother, is actually a “pond” in the middle of a big city where sewages from surrounded buildings and the slum flow to and upon which small shelters are built of bamboo and metal plate. It is far from being a healthy environment. However, it is the only affordable place to live in for many poor families. As Sajib is an innovative boy, he found out that many plastic materials are caught up in the water upon which the whole slum stands on bamboo columns. With the help of a neighbour he has built a watercraft out of plastics that he uses to reach the sewages on the water. What Sajib collects, he sells at the street collection point. The money goes to his grandmother, and they together buy rice and red lentils, or they pay part of the rent. Children from Chalantika, including Sajib, are similar to all children of the world – they are bright, curious, playful and clever. However, they are neither surrounded with adults that would pay attention to them, nor have a dignified environment, where they could develop their skills in all areas. They have no place to learn a regular regime, discipline, or hygienic habits, which they necessarily need for potential public school attendance or later employment. Children from Chalantika are street children – they grow up there, they spend most of the time there. The street literally brought them up. These children, from a very early age, are used to begging in some of the wealthy boroughs, collecting recyclable litter, hanging around the slum without any destination, doing various small or illegal jobs, etc. They are so-called small adults who actually bring up themselves and one another, but without education, as the education is unreachable for them, they are sentenced to spend their whole lives like this. Sajib did not even dream about going to school until one year ago, when he started attending the Chalantika centre. This centre for education and free time activities has the aim to improve the living conditions of children and their families in Chalantika slum via education. Sajib, alike other school children who were not attending school, started learning math and to read and write in local Bangladeshi. He learned basic English and necessary hygienic habits. In January 2015, he and 30 other schoolmates were able to enter public school together. He became an enthusiastic pupil. He still attends the Chalantika centre after school to participate in tutoring and games. There he can receive a nutritious lunch, school gadgets, and necessary medical support. The Chalantika centre is for children such as Sajib, a place where they have a background and feel safe. A place where they can personally grow, live their childhood and have the opportunity to obtain education. Just this opportunity means a chance for a better life in the future. The Chalantika centre means to “open the door” from the slum, which would otherwise stay shut without education.